Ariana Grande's concerts at London's O2 Arena on Thursday and Friday have been cancelled following the Manchester suicide bombing. On Monday, 22 people were killed and 64 injured when a bomber detonated a device as people left Grande's show at the 21,000-seater Manchester Arena. A statement said the US singer's Dangerous Woman tour would be suspended until 7 June. It added that Grande, 23, wanted to pay "proper respects to those lost". As well as two dates in London, concerts in Belgium, Poland and Germany have been cancelled. Grande's management said: "We ask at this time that we all continue to support the city of Manchester and all those families affected by this cowardice and senseless act of violence. "Our way of life has once again been threatened but we will overcome this together." The singer returned to her hometown of Boca Raton, Florida, on Tuesday in a private plane. It is hoped that the tour will continue on 7 June in Paris. 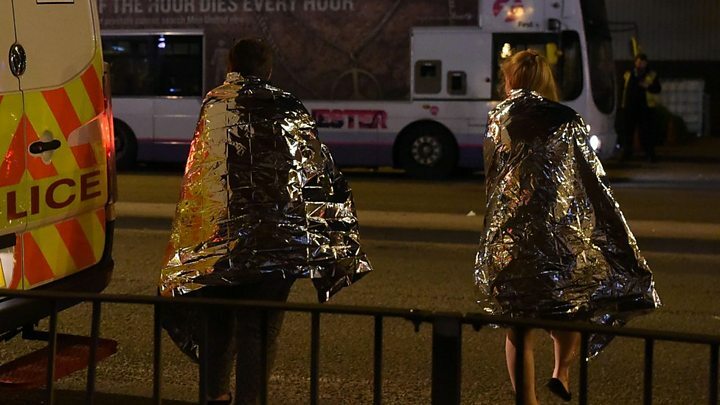 Children were among the dead in the Manchester attack, which targeted the foyer of the arena. Greater Manchester Police said it believed 22-year-old Salman Abedi, a former city student, had blown himself up. The attack has led to the UK terror threat being raised to critical - its highest level, which means an attack may be imminent. Police say they are hunting a network of people over the attack, and have made five arrests in the UK. Refunds will be granted to all ticketholders at the point of purchase for the cancelled shows, tour promoter Live Nation said. The first victim of Monday's bombing to be named was 18-year-old Georgina Callander, a devoted fan of Grande. The health and social care student had posted a message to Grande on Twitter before the event, which read: "SO EXCITED TO SEE YOU TOMORROW." On her Instagram page the Lancashire resident also had a picture with the actor-turned-singer, which had been taken in 2015. Other public events have been cancelled in London in the wake of the bombing. Chelsea Football Club cancelled their open-top bus, Premier League victory parade, which was due to take place on Sunday. The London premiere of the new Wonder Woman film, due for 31 May, has also been cancelled. Warner Bros said it would not be proceeding with press junkets or a red carpet event "in light of the current situation". Have you got tickets to an event in the coming weeks? Are you still planning to go? Share your views and experiences by emailing haveyoursay@bbc.co.uk.